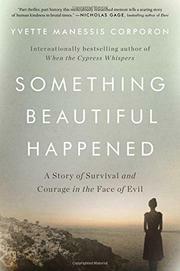 Continuing a tale echoed fictionally in her When the Cypress Whispers (2014), Emmy Award–winning writer and producer Corporon relates a story of compassion and collective resistance during World War II, linking it to contemporary events. A small island near the larger Adriatic island of Corfu, Erikousa served as an unlikely refuge when, as Allied forces advanced, the Nazis rounded up Corfu’s Jewish population and sent them by boat and train to Auschwitz. Perhaps 1 in 10 Jews survived, and that thanks to Christians who hid them away—often in plain sight, telling Jewish children to answer to Christian names: “From now on, your name is Nikos. Do you understand?” said one of the rescuers. “If the soldiers hear the name Daniel, they will know you are Jewish, and they will take you from us.” In a place marked by the old blood libels and ethnic uneasiness, the act was nothing short of heroic. When the Allied soldiers finally arrived later in 1944, many of the remaining Jews began to disperse, finding homes in Palestine and other lands. It took the author years to connect her grandmother’s occasional reminiscences with these larger events, and when, as an adult, she finally did, she began to retrace them, traveling to places such as Yad Vashem, Israel’s Holocaust memorial, as well as Erikousa. Corporon’s account can be a little by-the-numbers, a little too self-directed, and a little overly sentimental (“we hugged and we cried in a jumble of English, Greek, and Hebrew, but we understood each other perfectly”), but there is undeniable emotional power in the connections her story helps forge between the living and the dead, some of whom might be otherwise forgotten. The narrative gathers extra force when the author’s nephew is killed by an anti-Semitic gunman in a well-publicized attack in America, prompting her to wonder how removed the Nazi past really is from our own time. Heartfelt and most effective when the author’s lens moves from herself to the events beyond her.